When von Braun and his team moved to Huntsville in 1950, they found lush surroundings and agreeable weather in this cotton mill town with a population of some 16,000. While their professional lives were dedicated to realizing visions of flights into space, many of them were skilled amateur musicians who shared a deep-seated passion for classical music. When longtime residents Bill and Margaret Lindberg moved to what is now the Five Points area in 1955, they recall hearing their German neighbors playing chamber music on their porches. Bill’s reaction: “We have found an incredible little city! It’s only a matter of time before the new German residents will demand an orchestra!” As the Lindbergs would soon discover, an orchestra was in the process of being formed, and the first concert would come at the end of the year. In late 1954, Arthur Fraser of Montevallo met Huntsville cellist Alvin Dreger who described his musical associations with German scientists and their families. Together, they decided to start an orchestra. HSO held a public rehearsal at Huntsville Junior High School. Musical selections were interspersed with brief remarks by members, and those attending were given the opportunity to volunteer for the new symphony. Huntsville Civic Orchestra was chartered and the first board meeting was held on August 6 at the home of Mrs. William Mebane. The first agenda proposed a budget with expenses of $1,057, including $69 for facility rental, $100 for guest artist fees and a mileage reimbursement for Fraser who received no salary. The first board members were Rev. George Hart, Miss Dorothy Adair, Dr. Pat Hamm, Mrs. William Mebane, Mrs. H. E. Miller, Mrs. Conrad Swanson, Mr. Matthew Weber, Dreger and Fraser. The Inaugural Concert was performed at Huntsville High School, with baritone Andrew Gainey of Birmingham. The program included Corelli’s Concerto Grosso, Schubert’s Symphony No. 8 and three Christmas carols for audience sing-along. The concertmaster was Werner Kuers, a senior member of von Braun’s team. “Dr. Fraser has brought this orchestra a long way in a short time. . . .Perhaps the best way to summarize the evening is with four words all in capital letters HUNTSVILLE HAS AN ORCHESTRA!” Huntsville Times, December 14, 1955. The Orchestra’s second concert featured the first of many collaborations with the Huntsville Community Chorus. Directed by Mrs. Pat Hamm, the chorus joined the Orchestra in the Stokowski arrangement of Bach’s Come Sweet Death and George McKay’s Lincoln Lyrics. The first fund-raising event assisted the struggling orchestra. The Grace Club Auxiliary (now the Junior League) adopted the fledgling group as its beneficiary that year, and organized an evening of ballet with the Orchestra and the Birmingham Ballet Company. The orchestra received $1,300 and much positive publicity. The first subscription drive and development campaign was launched. “One thousand memberships and many contributions have been set as the goal by the Huntsville Civic Orchestra in a fund raising campaign from Sept. 3-21, to meet a budget of $3,500”, The Huntsville Times, August 16, 1957. Contributors of $10 or more were listed as Benefactors. Season ticket prices for the five concert series were $3 for adults and $1.50 for students. HSO performed the first youth concert at the Huntsville High School auditorium, sponsored by Valley Pride Packing Company. Free refreshments were served, and a bicycle was given away as an “attendance prize.” Three advance radio programs broadcast on WFUN introduced children to the different sections of the orchestra. A letter writer to the Huntsville Times applauded the concerts, saying, “The fact that about 1,000 children went out in the rain Saturday to attend the Youth Concert shows…that there is an interest in something besides hillbilly and rock ‘n’ roll…Other businesses could follow the lead of Valley Pride in financing a little culture for our community.” With strong support from the Guild, the Young People’s Concerts became an annual event in 1962, and today four performances are presented in February of each year to 8,000 fourth graders. Arthur Fraser resigned, due to health concerns and increased professional responsibilities. “The first year he received only travel expenses, and although honorariums were provided for the next three years, they were little enough for Dr. Fraser’s contributions to the cultural life of this community. The orchestra is well-established now, with eight concerts next year. . . .In September, it will have its first resident conductor. Nevertheless, the tall, slender man on the podium will be sincerely missed by a grateful community.” Huntsville Times, May 18, 1959. Russell Gerhart was engaged as the first resident conductor at a salaryof $3,000. Gerhart stated that Huntsville’s “great opportunities for musical growth and development” attracted him to the post. In a short time, he transformed the ensemble into “a musical organization that can be taken seriously” (Huntsville Times) and articulated his vision of a professional orchestra in Huntsville. The Huntsville Symphony Orchestra Guild was officially organized under the name of Huntsville Civic Orchestra Guild. Mrs. Jesse (Mildred) Anderson served as the first president. The organization effort started two years earlier by a group of energetic women who conducted a successful season subscription drive. Thanks to the Guild’s efforts, the Orchestra enjoyed its first sold-out season in 1964-65. An appeal for “recycled tickets” appeared in both newspapers. The Guild organized the first Symphony Ball. This glittering event completed the fund-raising for the Symphony’s state-of-the-art acoustical shell with a price tag of $10,000. The Huntsville Civic Orchestra changed its name to the Huntsville Symphony Orchestra. Russell Gerhart retires due to declining health. Marx Pales is engaged as third Music Director and Conductor. Russell Gerhart died in February in Huntsville; Arthur Fraser died in April in Columbia, South Carolina at age 56. The Symphony Guild organized the first Crescen-Dough Auction as a one-time project to raise funds for the commission of a composition for world-premiere at the opening of the Von Braun Center Concert Hall. Due to its popularity and success, the Auction immediately became an annual event. HSO opens the Von Braun Center Concert Hall with world premiere of Galileo Galilei by Lee Hoiby. Headline proclaims “Hoiby Oratorio is Achievement of Significance.” “As I looked out over the packed audience seated in that magnificent concert hall, a great big lump came in my throat.” said Bill Kling, president. Mary Silvia Armstrong of the Huntsville Times wrote that the oratorio “brought a capacity audience to its feet with accolades for the composer Lee Hoiby, author of the text, Barrie Stavis, the conductor (Marx Pales), members of the orchestra, the Community Chorus and the star-studded cast.” According to reviewer John Chambers, “Lady Shivers Tucker, mezzo soprano – gorgeously arrayed in all white – was marvelous as the Narrator.” Other soloists included John Reardon of the Metropolitan Opera, Max Worthley, Mary Beth Peil and Huntsville’s own Albert Lane. 25th Anniversary season began. A sold-out season featured opera legend Beverly Sills. The Arthur Fraser Memorial Award produced a commissioned work by Fisher Tull, which received its world premiere on March 24, 1979. First executive director Robert McMullin was hired. He served in the top administrative post until July of 1987. Paul Clemens succeeded him in October of 1987. Subsequent Executive Directors were Gloria Holdman (1990-1993), Sam Woodward (1993-1998), David Todd (1998-2002) and Robert Crook (2002-2003). 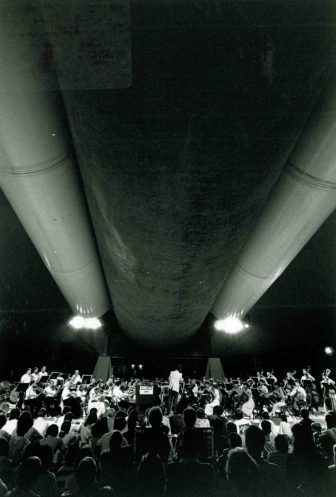 Orchestra performed a concert under the Shuttle Pathfinder as part of “Footprints on the Moon,” the 20th Anniversary celebration of the Apollo 11 and the first moon walk. Astronauts Neil Armstrong, Mike Collins, Edwin “Buzz” Aldrin, Alan Bean, Alan Shepard and others were on hand that week for the celebration. The three-concert Pops season was launched. Over the years, the HSO performed with stars such as Judy Collins, Bobby Short, Michael Martin Murphey and Keith Brion who portrayed John Phillip Sousa. The HSO performs with the Moody Blues. “Blend the haunting strains of 1960s pop-rock music with the trill of classical violins. Add a mixture of distinguished symphony goers and aging hippies from the flower-child generation. That’s what to expect from tonight’s concert when the British rock band Moody Blues merges with the Huntsville Symphony Orchestra,” Huntsville Times, July 13, 1994. This unique event reached an entirely new audience, many of whom still ask when HSO and the Moody Blues will perform again. The Chamber Symphony series was inaugurated. Shining the spotlight on the HSO’s talented principal players, this three-concert series was performed in the intimate surroundings of area churches and in run-out concerts to neighboring cities. 40th anniversary season Gala Concert featured violin virtuoso Itzhak Perlman who performed Tchaikovsky’s Violin Concerto for a sold-out audience. Taavo Virkhaus conducted this concert which also featured Ravel’s Bolero and Roman Festivals by Respighi. The Symphony School of the Huntsville Symphony was founded. HSO was selected by the National Guild of Community Schools of the Arts to receive a start-up grant and technical support. Major funding during the first three years was provided by the Pei-Ling Chan Trust and Dr. Tony and Kathy Chan. With support from the Sexton Foundation and the Baker Foundation, the Symphony School established the Third Grade Violin Program in the Decatur City Schools. HSO now has partnerships with six North Alabama school districts to enhance the elementary music curriculum. The opening concert of the season came four days after the September 11 attacks in New York. The guest pianist Louis Lortie was not able to fly to Huntsville from Canada for his appearance, necessitating a program change. Like many orchestras across the nation, the HSO, led by Taavo Virkhaus, took the opportunity to program a concert dedicated to the victims and designed to bring comfort to a grieving audience, thus demonstrating the true power and significance of this art form. The Huntsville Symphony Orchestra Guild’s annual contribution exceeded the $200,000 mark. Since 1964, the Guild has provided substantial financial support to the HSO. Carlos Miguel Prieto of Mexico became the fifth Music Director and Conductor of the HSO. The appointment culminated an international search producing over 200 applicants and five finalists who guest conducted during the 2002-03 season. The charming and youthful Prieto immediately energized the orchestra and community. Ticket sales goals were exceeded and in February of 2004, the first sold-out concert in years necessitated audience seating on the stage. The Chamber Symphony concerts took a new name and new direction as HSO inaugurates the Mainly Mozart Series. The Prieto String Quartet made its Alabama debut in a fund-raising concert at the Temple B’Nai Sholom in downtown Huntsville, witha post-concert reception at the home of Nanette and Charlie Yarn. The event raised some $25,000 for the HSO. Dorcas Harris was appointed the organization’s first President and CEO, the top administrative position. As a result of Harris’ association, HSO realized immediate gains in contributed income. Fraser contributed a remarkable amount of skill, dedication and time to building an viable orchestra for Huntsville, including a governing and support structure. He received only travel reimbursements, and accepted an honorarium only when there were surplus funds. Nevertheless, through his guidance, the fledgling organization was positioned to compensate a full-time resident conductor upon his retirement in 1959. Although his tenure was very short, his achievement was spectacular. Russell Gerhart received his violin training from Ralph Lewando, Carl Malcherek, Elias Breeskin and Mischa Mischankoff. He was an active member of the conducting class at the Berkshire Music Center under Serge Koussevitsky. Prior to his appointment in Huntsville, Gerhart conducted both the St. Louis Philharmonic and the St. Louis String Ensemble. Born in Altoona, Pennsylvania, Gerhart went to Europe to pursue violin studies, and returned in time to serve in World War I. After the war, he began teaching violin lessons in Altoona. With his students and his wife, Martha, who was also a musician, he formed the Gerhart String Ensemble. Founded in 1928, the group evolved into the seventy-six year old Altoona Symphony Orchestra, now a fully-professional ensemble serving central Pennsylvania. Marx Pales became the third Music Director and Conductor of the Huntsville Symphony in 1971. He was professor of violin, viola and conducting at the University of Alabama in Huntsville for many years. Born in Cleveland Ohio, Pales began violin studies with his father at the age of six. He earned degrees from Baldwin-Wallace Conservatory and Columbia University. Before his appointment in Huntsville, Pales was professor of violin and conducting at the University of Arkansas, where he founded the University-Fayetteville Symphony Orchestra and the Fayetteville Youth Orchestra. He was also music director and conductor of the Fort Smith, Arkansas, Symphony for six years. Artistically, Pales is best known as a champion of new music. During his tenure, the HSO commissioned and premiered two new compositions, and received awards from the American Society of Composers, Authors and Publishers (ASCAP) for “Adventuresome Programming” in 1972 and 1975. A conductor of uncompromising musical standards, Taavo Virkhaus guided the HSO’s dramatic transformation from community orchestra to a critically-acclaimed professional orchestra drawing fine musicians from throughout the southeast region. Virkhaus was born in Tartu, Estonia and emigrated to the United States in 1949. He is the son of the late conductor and composer Adalbert Virkhaus. He was educated at the University of Miami (Florida) and the prestigious Eastman School of Music. Virkhaus studied conducting at the world famous Berkshire Music Center at Tanglewood and in Europe as a Fulbright Scholar. Guest conducting engagements include the Rochester Philharmonic, the Baltimore Symphony, the Minnesota Orchestra, the Vancouver Symphony, the Delaware Symphony and others. He has conducted orchestras in Estonia, Russia and Finland, and was the Music Director and Conductor of the Duluth-Superior Symphony Orchestra in Minnesota from 1977 to 1994. A gifted composer, Virkhaus’ major works for orchestra include five symphonies and two violin concerti. His compositions have been performed by orchestras such as the Baltimore Symphony, the Minnesota Orchestra, the Eastman Rochester Symphony, the Duluth-Superior Symphony Orchestra, and the HSO. His violin concerti are championed by noted violinist Stephanie Chase, who performed both in Huntsville.